For as long as I can remember, people have been taking bites out of the notion that Christopher Columbus was a hero. Maybe it was just my liberal New York upbringing, but I just cannot recall a lesson or discussion about the guy without a crack about how mistaken he was and what a terrible thing Americans did trying to say he discovered our country. In 1492, what did Columbus do? So yes, it’s not new to me to prod that gallant story with a sharp-tined fork. But still I will offer a little suggestion for how to celebrate this Columbus Day–a.k.a. Indigenous Peoples Day–in politically-correct foodie style. I say to eat the “Three Sisters”–the trio of corn, beans, and squash–that was a part of the real, original American food culture. If that got your thoughts flowing but you don’t have recipes on hand for those things, here are a couple of squashy-corny-beany dish ideas with all the particulars. Preheat oven to 375 F. Pierce the whole squashes with a fork several times. If you have a cleaver or you’re feeling macho, hack open each squash (preferably cutting it right down the middle into 2 identical pieces) and remove the seeds. Place whole squash right side up or squash halves cut side down on an oiled baking tray. Bake for 30-60 minutes or until a fork goes in with a little resistance. While the squash is cooking, you can prepare the polenta. Heat the olive oil in a skillet and sauté the onion for a few minutes, then add the garlic and jalapeño and sauté a few minutes more. Set the veggie aside. In a heavy-bottomed saucepan, heat the 4 cups water to a simmer and slowly add the cornmeal, stirring constantly. Add a dash of salt. Lower heat and continue at a leisurely simmer for about 30 minutes, stirring occasionally. When the polenta is thick and smooth, remove from heat and stir in the veggies. Taste and add salt to taste. Now go back to the squash. If you’re using acorn squash or another smallish, round squash and you’ve baked them whole, at this point you can cut off the tops. They will look like they’re about to become mini jack-o-lanterns. Set the tops aside and do not re-bake them. They’re just for show. 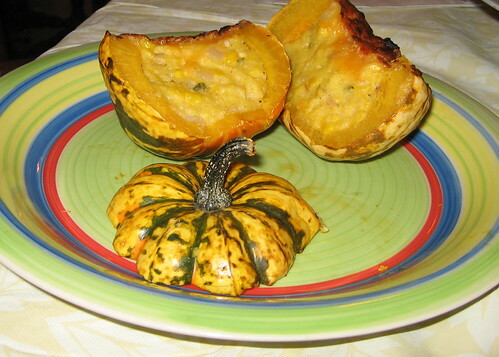 If you’re using larger squash, cut them in half. With whatever kind of squash you’re using, at this point you’ll need to remove the seeds. Also scoop out some of the insides until you have a generous amount of stuffing space. Stuff each squash up to the top or a little more. Return to the oven to bake at 375 for another 30 minutes or until the squash is good and soft. If using cheese, sprinkle it on top of the squash at this point and bake or broil until the cheese is melted and bubbly. Serve with the tops on or near the squashies, or cut squash into wedges. Try it with salsa! Heat oil in a medium saucepan on med-high. When hot, add onions. Cook for a few minutes, stirring occassionally, then add the garlic and stir again for about 30 seconds. Add the peas, water to cover the beans plus another 1/2-1?, and the kombu. Cover and bring to a boil. Let simmer for 25-35 minutes, stirring occasionally and adding water to keep the water level about 1/2-1? above the roiling stew. Oh, add the salt somewhere in there, preferably when the beans are getting soft and not before. Check the beans for doneness and cook more if necessary. Adjust salt and add other seasonings if you so desire. Add the sorrel and simmer another 2 minutes, then remove from heat. Â As far as the kombu goes, when the stew is done, I recommend fishing it out and then either chopping it up and throwing it back in or eating it right then and there. You can also throw it away. At that point, it’s done its job of adding flavor to the beans and making them more digestible, but I think there’s still more life to it. That’s all, folks! Enjoy this stew over rice or just dig in with a spoon. I predict you’ll feel very Southern. This entry was posted in Holidays, Recipes. Bookmark the permalink. Celebrating the Three Sisters would be very appropriate (and delicious) for Indigenous Peoples Day! People should pay them a little more reverence or at least remembrance throughout the harvest season. Where would we be without them? Corn especially? I’m open to suggestions for a recipe name!